Book a weekend getaway in our guest house that features hot breakfast, comfortable rooms, and a spacious deck. 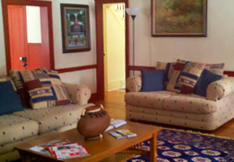 Located in a peaceful and mountainous area, our bed and breakfast is also close to shopping and attractions. 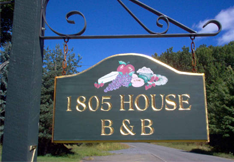 1805 House B&B is a charming guest house located near Hudson, New York. Tucked in a quiet, rural area, our bed and breakfast welcomes weekend travelers and destination weddings. With more than eighteen years of experience, we offer competitive packages that present both a good value and wonderful experience. Please let us know of any dietary restrictions, and we will do our best to accommodate you. Come stay with us to enjoy the rural beauty of our surroundings. Built in 1805, this building became our bed and breakfast in 2000. Growing up in the area, we wanted to reach a larger community and invite travelers into these peaceful surroundings. The eighth president, Martin Van Buren, grew up near this historic location. Plan a trip to our restful country home and rejuvenate yourself.